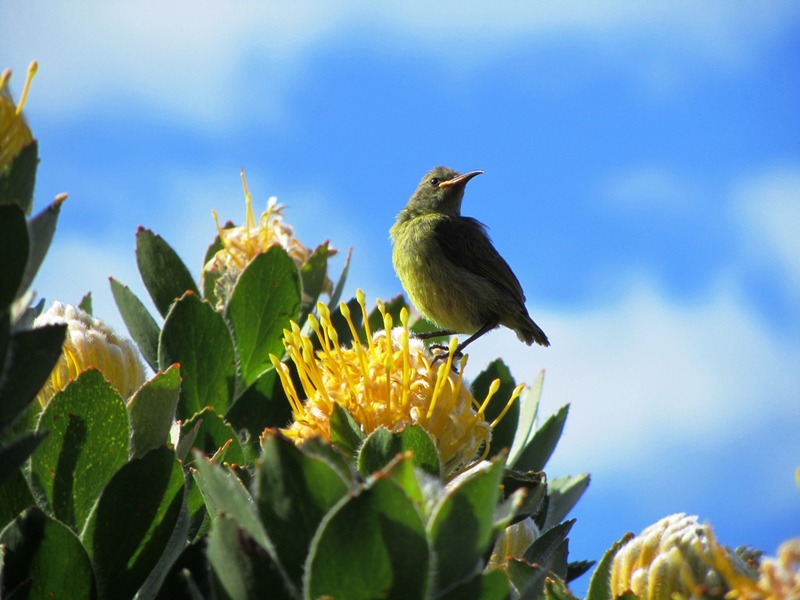 Birds encountered on Table Mountain and in the Western Cape in general. I am not much of a “twitcher”, and you can well imagine I do not like to remain still for long. But sometimes curiosity gets the better of me, and I need to put a name to a LBJ. 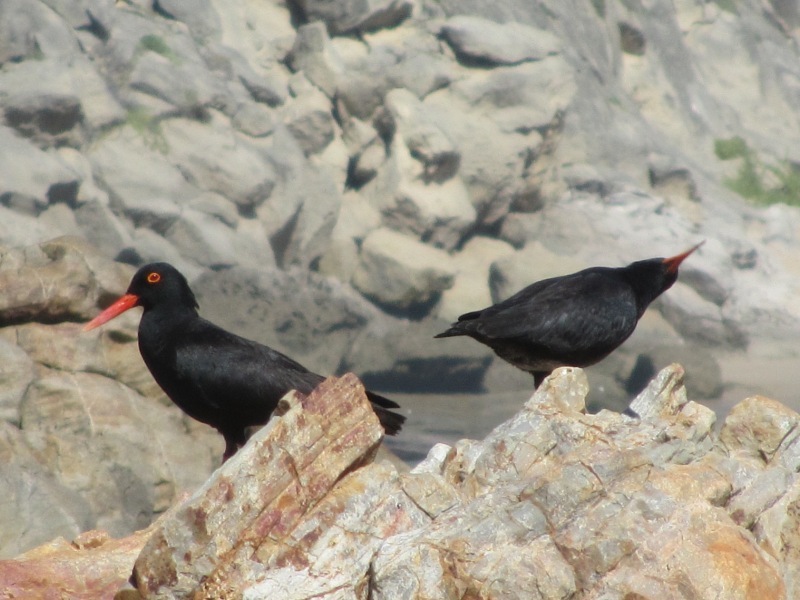 Oystercatchers mate for life, and can usually be seen in pairs. 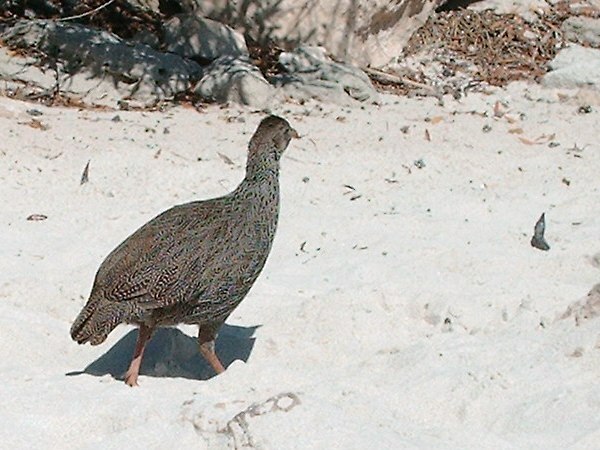 They are endangered, and care should be taken not disturb them, or trample their nests which are usually found in dunes (one of the reasons vehicles are not permitted on most beaches in South Africa). 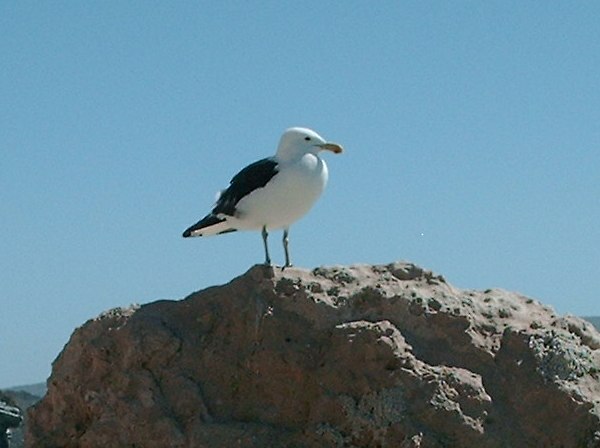 They occur quite commonly on both beaches and rocky stretches of the South African coastline. 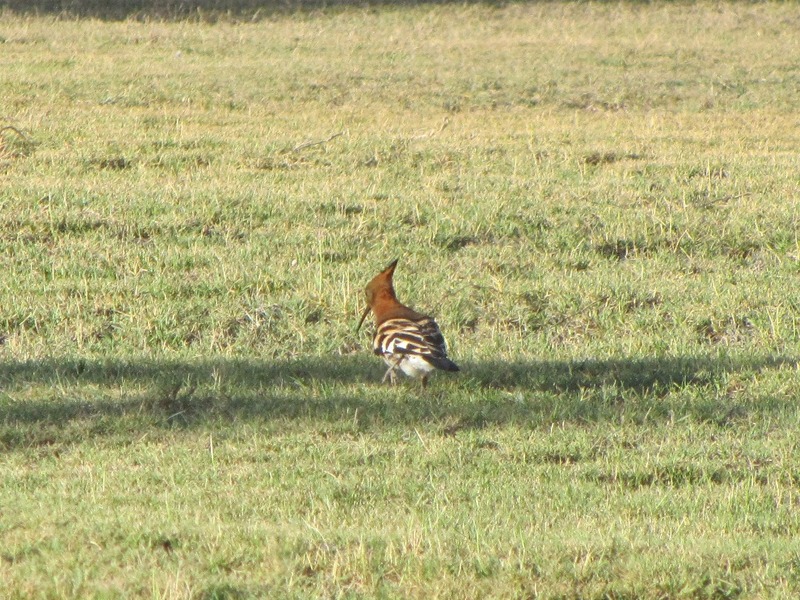 I remember seeing Hoopoes in the garden when I was very young. These unmistakable birds are fairly rare. 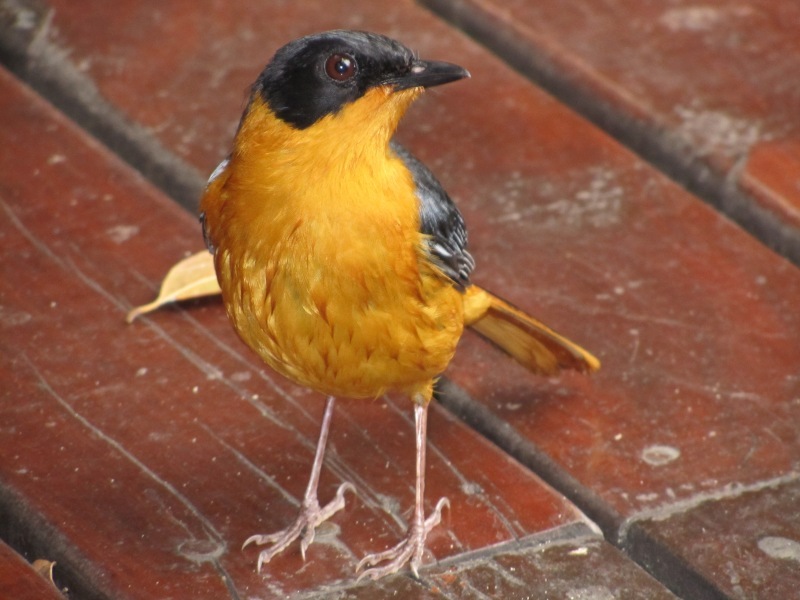 The distinctive orange colored head and crest and the long slender bill make these birds easy to identify. We have a resident pair on the farm in Knysna. 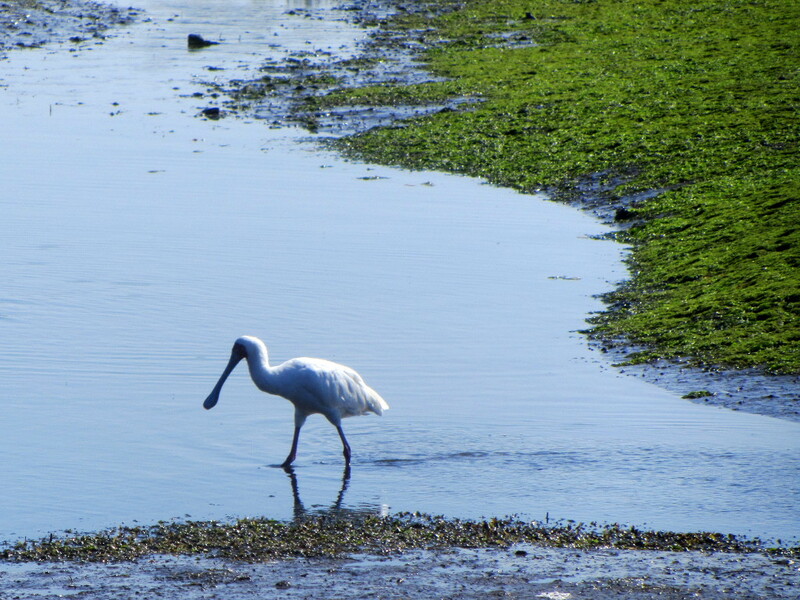 I spotted this guy shuffling along in the Knysna Estuary near to the Leisure Isle causeway. 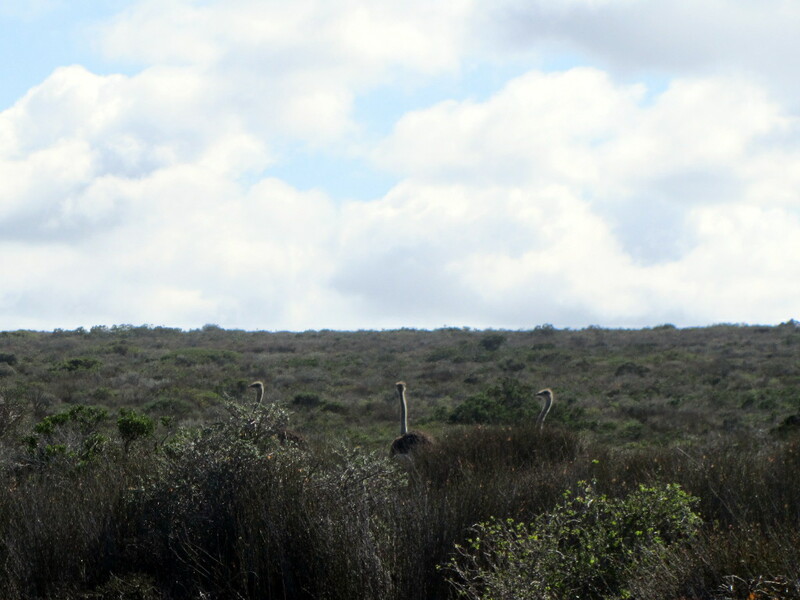 They can be seen in numbers on the salt marshes on the left of George Rex Drive nearby. This elegant bird is the national bird of South Africa. 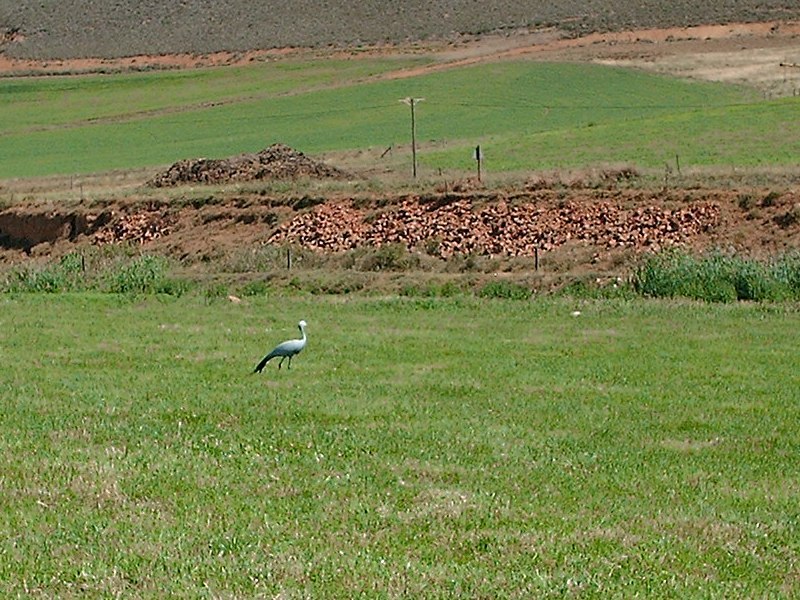 I spotted a flock in some farmlands near Greyton. 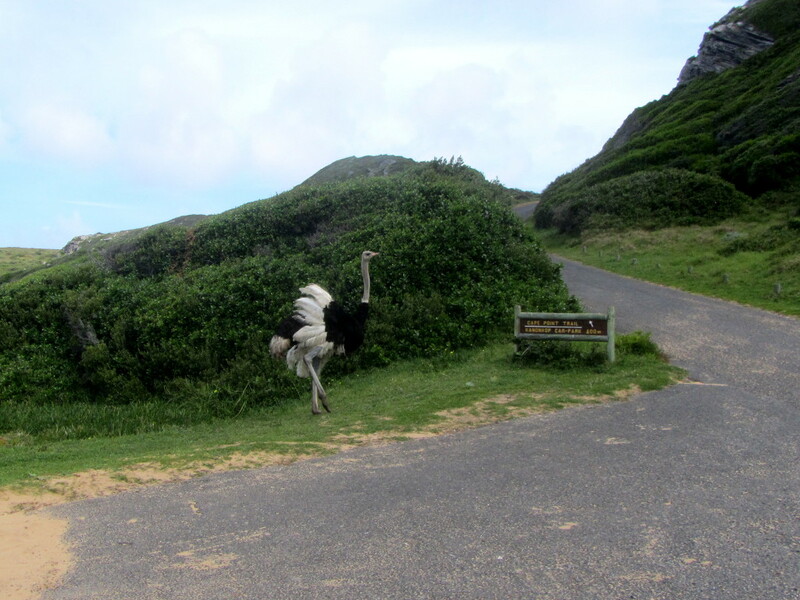 They were incredibly skittish, and I couldn’t get within 100m of them. Spotted this one on the beach at Kraalbaai in the West Coast National Park where he seemed quite out-of-place! 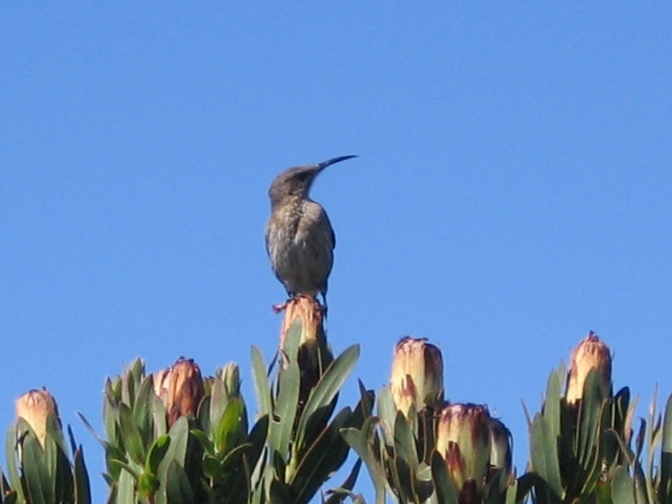 You will see these little guys flitting from protea to protea using their long curved beaks to get to the nectar. The tail of the male bird can reach 3 times its body length, the tail of the female is shorter. As I guess should be expected, we heard this little guy before we saw him! 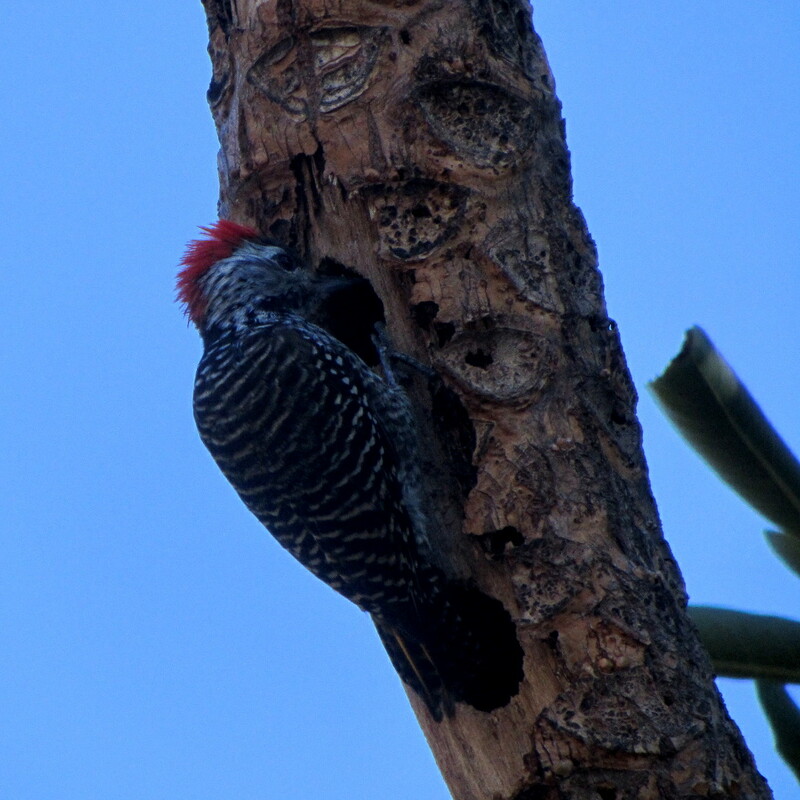 We followed the incessant tapping and found him drilling away at a tree outside the reception building at Mount Ceder in the southern Cederberg. He was not timid at all and continued pecking at the wood despite all the noisy activity on the ground below (including people, horses and vehicles). His bright red crest looked surprisingly spiky when raised. This gorgeous guy came to visit us on the deck of our Forest Hut at De Vasselot Rest Camp in Nature’s Valley. 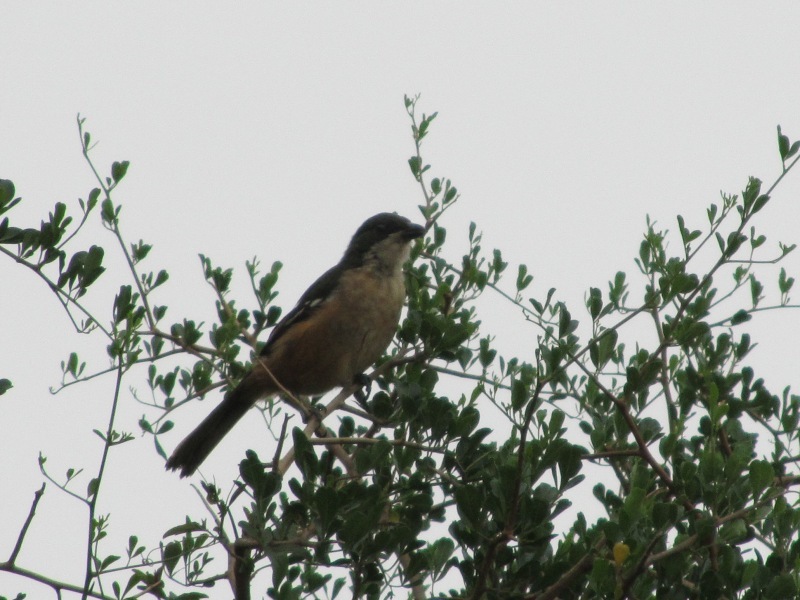 A member of the shrike family found through most of Sub-Saharan Africa. I remember these birds visiting my grandparents garden, and them calling it a Butcher Bird. We came across one that we assume had found a dead rodent which it was trying to carry across the dirt road, despite it being many times larger than itself. I have since identified the mouse as a Striped Mouse. 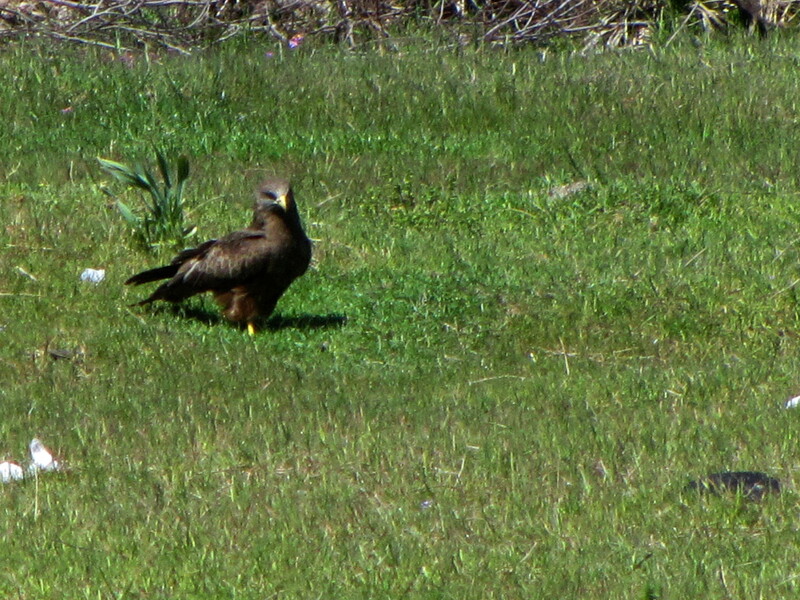 We regularly see a Jackal Buzzard in the area. They often interact with the Yellow-billed Kites in dramatic aerial displays. We also spotted one whilst horse riding at Mount Ceder. 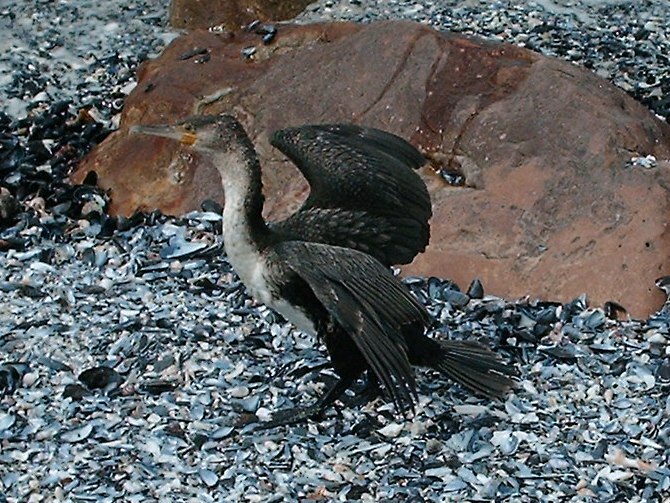 Common scavengers on the coast of South Africa. We were welcomed to our Forest Hut at De Vasselot Rest Camp, Nature’s Valley by a couple of Loeries. 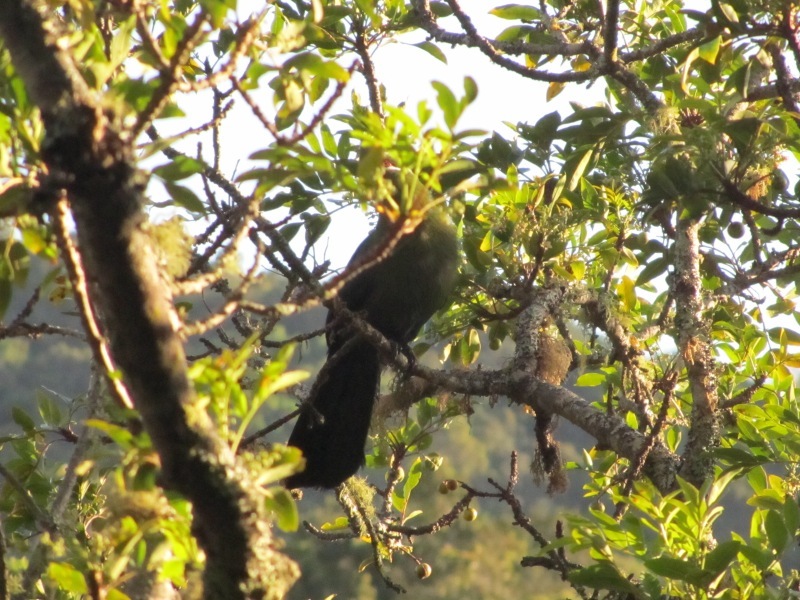 Unfortunately, they would not play along, and I only managed a shot of one of them hiding in the upper branches of the tree next to the hut. More recently we had a lovely sighting at the Harkerville Forest during the Hi-Tec Forest Family Hike: we had just headed into the forest when I heard the alarm call and there must have been at least 4 in the tall trees directly above us. 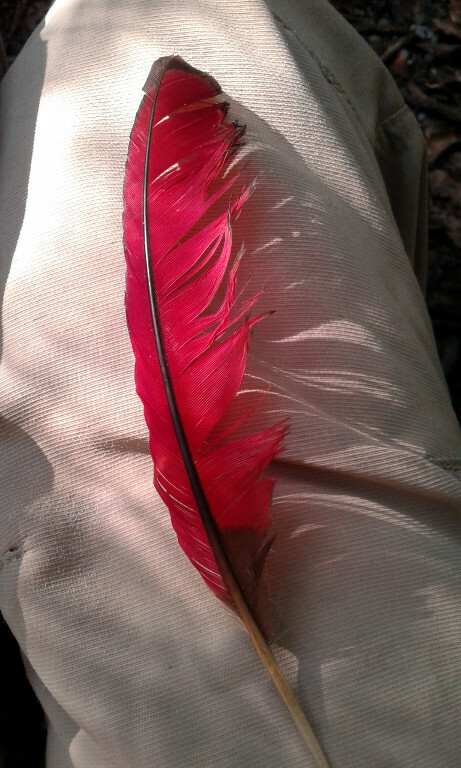 These beautiful birds are most striking in flight when the crimson outer primary feathers under their wings catch the sunlight. They make a surprisingly loud and not particularly beautiful “ko-ko-ko-ko” sound when they are alarmed. They are often seen running along branches from tree to tree in the dense forest canopy. 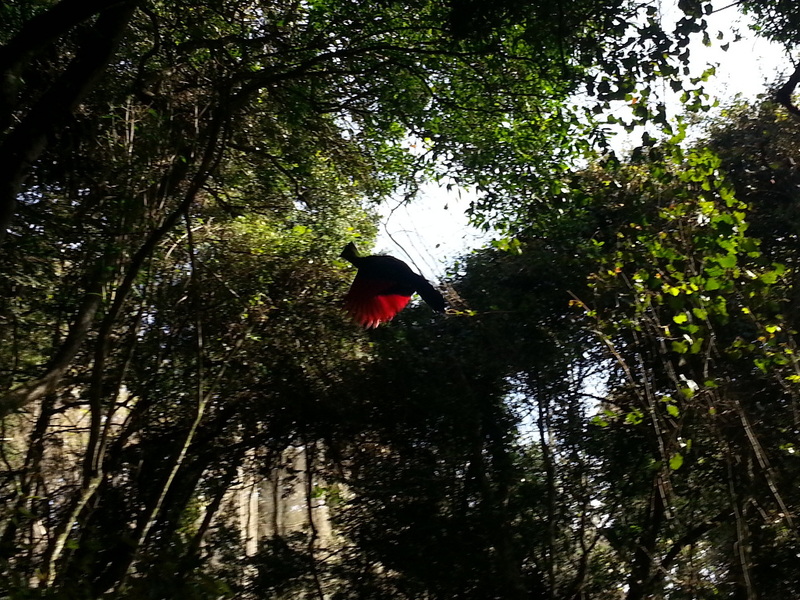 To really get to see these beautiful birds we recommend a trip to the spectacular Birds of Eden near Plettenberg Bay: whilst seeing them in their natural habitat is a magical experience, getting up close to them is equally amazing! 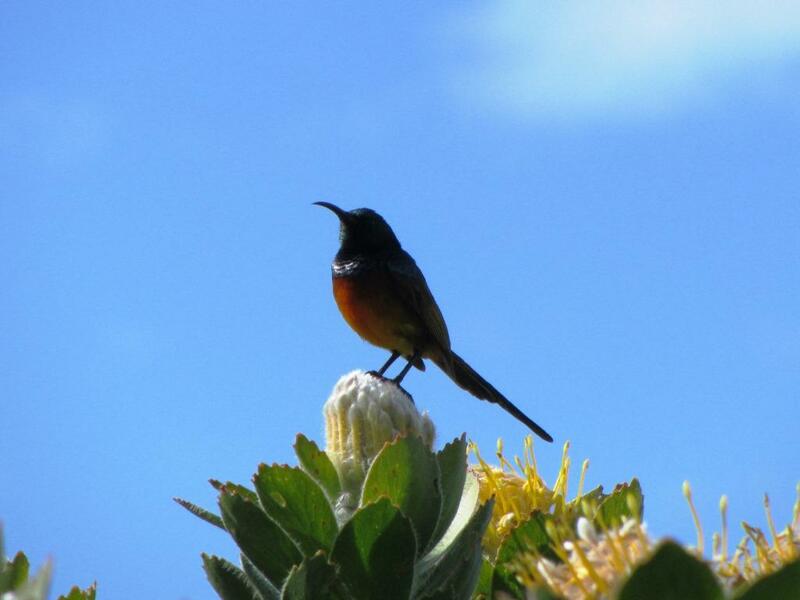 These colorful little guys can be seen sipping nectar from proteas and pincushions with their delicate, curved bills. 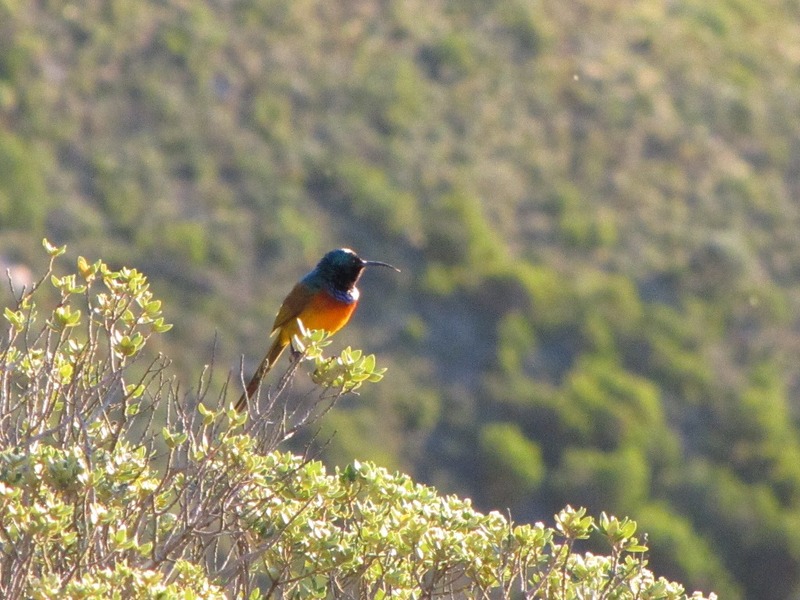 Their wings make a distinctive “whirring” sound, and you will often hear them in the fynbos before you see them. I hope I have identified the juvenile in the photo correctly: I saw her in the company of some adults, and the description matches that given in my bird guide. Sightings: Silvermine East; Pipe-track; Kalk Bay Mountains. Commercially farmed in South Africa, originally for their plumage but now more importantly for their healthy meat, the ostrich is a fairly common feature of the South African landscape. As is often the case with bird, the male has showy plumage of black and white which was responsible for a boom in the ostrich industry of Oudtshoorn in a bygone era. 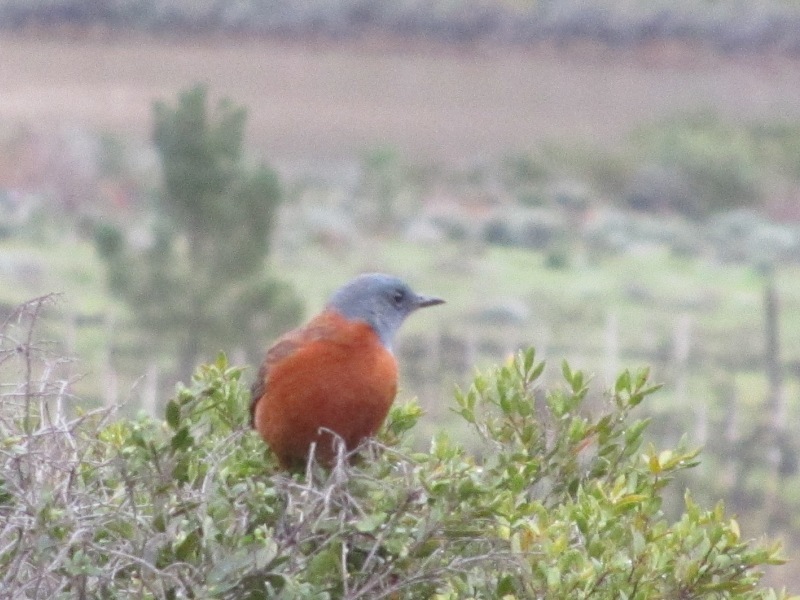 Red-winged Starlings are to be found everywhere on the Peninsula. They are noisy, cheeky birds. They are almost entirely glossy black, with the exceptions of the chestnut flight feathers. These large pigeons are a common sight in suburban areas. 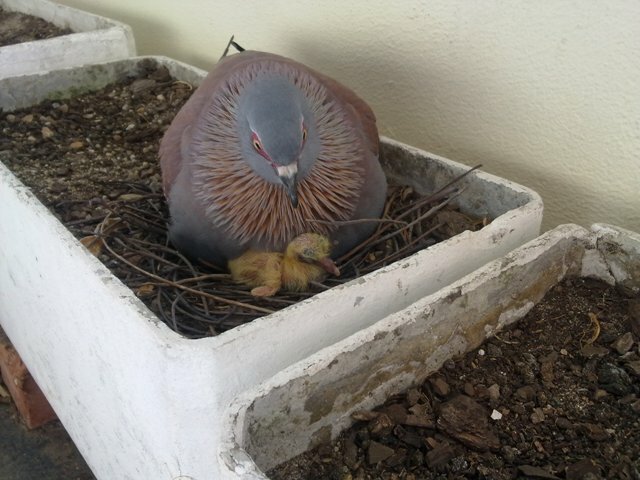 I had a pair nest on my balcony and before I knew it I was host to a messy, noisy family of four. The information below is from the fascinating presentation I attended by Megan Murgatroyd on her Black Eagle Project. The Black Eagle is now correctly known as Verreaux’s Eagle. 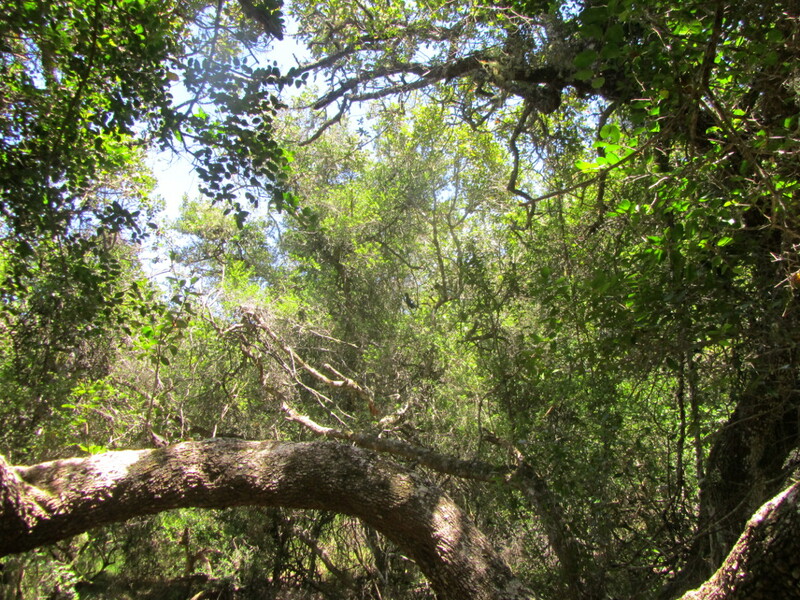 There is a long history of breeding pairs on the Peninsula. 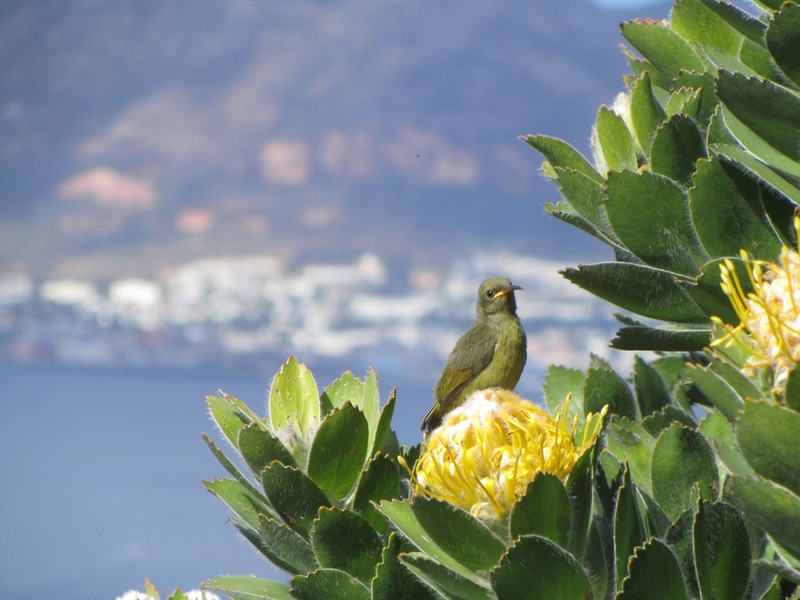 Currently there is one successful pair in Silvermine area, using the same nest since 2005. Spotted this fellow alongside the walkway between Muizenberg and St. James. We see lots of these beautiful birds on the farm up the West Coast. At first I battled to identify them as from a distance I could not see the fork in the tail. 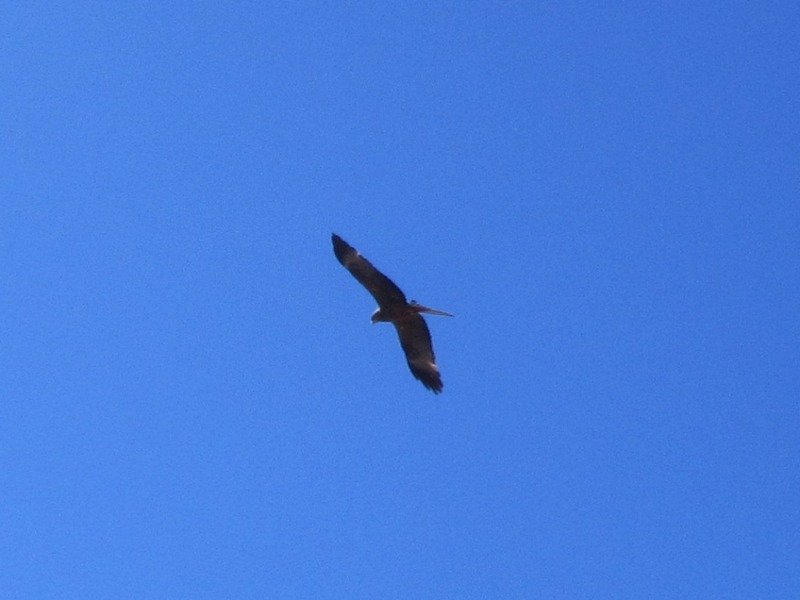 The kite flies with a distinctive loose tail movement — the tail swivels quite freely and quickly — but the identification was only confirmed when I got to see a bird a bit closer and finally saw the fork in the tail. It’s bill is entirely yellow, it has yellow legs and chocolate-brown feathers. One of the dogs caught a small mouse, but because he had most of his teeth kicked out by a horse, he had no real way of killing it, so I despatched the little guy, and threw his body into the paddock. 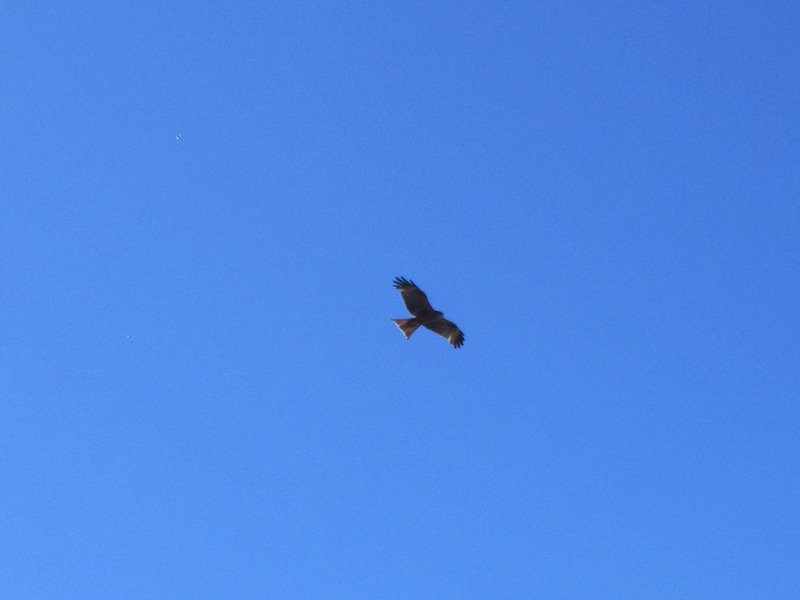 We then noticed a kite zoning in on the paddock, so I got my camera out and tried to take some shots. More often than not I am unable to name the birds I see. I recently purchased a copy of the Complete Photographic Field Guide: Birds of Southern Africa and will have to try to educate myself! 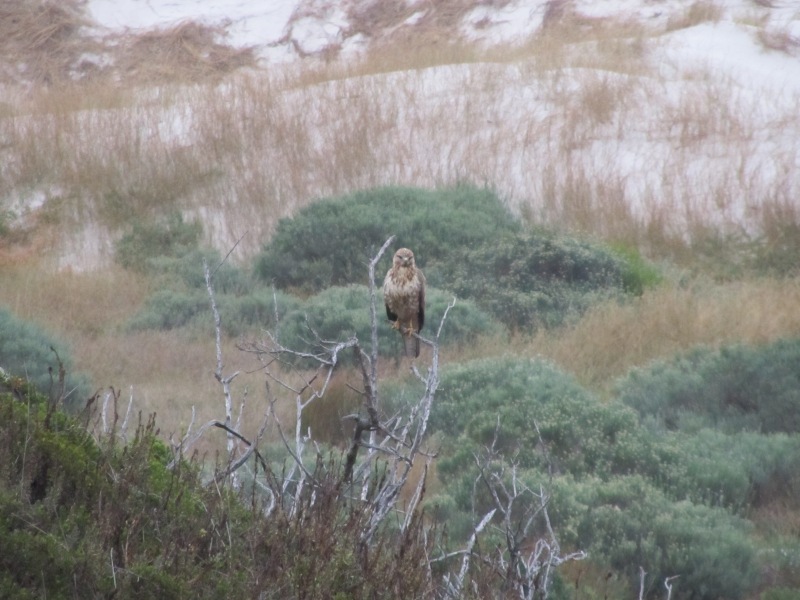 Here is a photo of a raptor that I saw on the dunes near the parking lot at Noordhoek Beach. The bird seemed a bit out-of-place, and I would love to know what it is.